I know Frittatas are suppose to be cooked in a pan on the stove and then finished by baking the top with high oven heat but that just doesn’t fit well into my morning time-frame. The faster they cook, the better. I divide the frittata mixture into fourths with a spatula and then flip them each over to quickly cook on the other side. So maybe its not technically a frittata, if we flip it, but that’s what we like to call it (with an Italian accent of course). Do what works best for you and call it what you want but I think you will enjoy it. Instructions for cooking it the traditional Frittata way is included at the end of the recipe. It’s worth the effort if you’re trying to impress someone since it comes out prettier. I like to keep cheese just as a condiment and/or just for rare occasions since raw cheese is a little pricey. I like to keep a good quality shredded cheese on hand in the freezer for those special times. 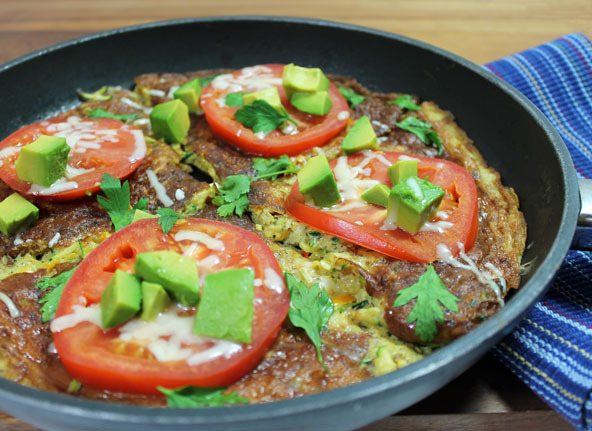 I love this Frittata recipe because it’s packed full of vegetables, easy enough and quick enough to throw together for breakfast and I know everyone in my family really likes it. Try drizzling the Two-Ingredient House Dressing recipe on top. Vegetable toppings like tomatoes and avocados are the best but I was temporarily out of them so I went with the cheese. Of course it was delicious! In a large mixing bowl add the eggs and stir or whisk together. Shred the zucchini, yellow squash and bell pepper in a food processor using a shredder blade. Add this to the bowl with the eggs. Dice the green onion and add to the bowl. Add the sea salt and seasonings of choice and stir or whisk all the ingredients together except the tomato, avocado, cheese and additional parsley saved for the toppings. Prepare a 10” sauté pan with the coconut oil heated to medium high. Add the frittata mixture to the pan. Divide the frittata into fourths so that you can turn them over easily. Turn each section of the frittata over to cook on the other side. Top with sliced tomato, diced avocado, diced parsley and shredded cheese if desired. Put a lid over the pan to help melt the cheese and warm up the toppings. Remove the frittata to a plate. Store leftovers in a sealed container and keep refrigerated for later. Pour the whole mixture into a sauté pan (one with a metal handle that can go into the oven) and cook for 4-5 minutes on medium heat. Once it has cooked on the bottom half, transfer the pan to the oven set for 500 degrees and broil for 3-4 minutes. Remove from oven and place the toppings on top. Place back in the oven just long enough to melt the cheese or warm the toppings if desired. 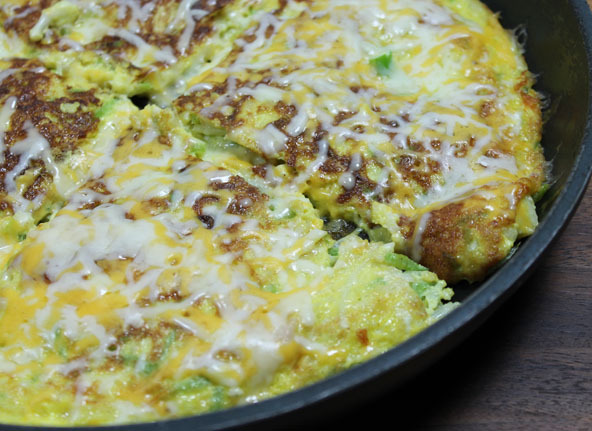 Remove the frittata from oven once again and cut into desired servings and serve immediately.